This Amaya-powered slot stands out from its peers through an unconventional reel configuration and an array of unique features that will take the fancy of every slot devotee. Instead of a typical 5x3 or 3x3 layout, the slot has 4 reels and 4 rows. In addition, the payline patterns available in the game are also arranged in an unusual manner – the ten paylines go horizontally (4), vertically (4) and diagonally (2). A bet size vary from a minimum of $1 to a maximum of $50 per spin. There are three symbol sets used in the game: fruit (low-paying symbols), 7s of different colors (mid-paying symbols), and the icons that show famous landmarks from several European countries (high-paying symbols). 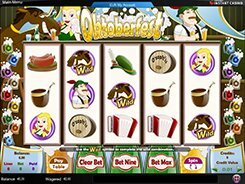 The highest payout of 2500 coins (up to $12,500) is awarded for hitting four Jackpot symbols across a payline. Besides, the slot has two bonus symbols depicting a train and a ship. Whenever any bonus symbol appears in view, it adds to a corresponding bonus trail to the right of the reels. To start either bonus round, you need to collect a total of ten identical bonus symbols within a gaming session. Should this happen, you get access to a bonus feature that may award a decent amount of coins. PLAY FOR REAL MONEY!